This Orange-powered Billboard certainly makes a statement. 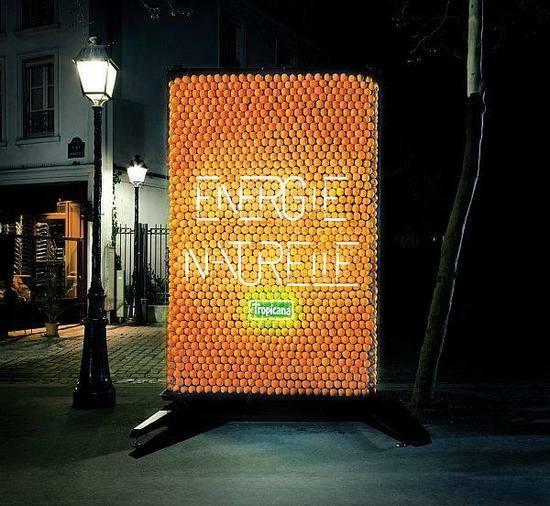 Instead of drawing mains electricity to light up, the billboard uses a large quantity of oranges to produce its energy, powering the board in a more environmentally friendly way. The Orange-powered Billboard has been created by advertising agency DDB to advertise Tropicana orange juice. The board works on the same principle we all have played with as children (For those that haven’t, the Enviro Battery Educational Kit is a must buy! ), the power comes from an electrochemical reaction. In this case the acid of the oranges reacts with the copper and zinc spikes they have been stabbed onto, it took 3 months of testing to create the impressive orange board. It uses thousands of spikes to make up the internal structure of the board, with the oranges carefully pressed onto the spikes to create a giant multi-cell battery. The Orange-powered Billboard lights up a sign that reads ‘natural energy’ in french, and the Tropicana logo. The billboard certainly makes you think about oranges, and is obviously a great advertising campaign. The board can be placed anywhere, without the restrictions of mains power supply most billboards have. Hopefully it will inspire others to find creative and green ways to advertise their products in future.